"None of this would have happened if Mr. McAllister hadn't meddled the way he did. He should have just accepted things as they are instead of trying to interfere with destiny. You see, you can't interfere with destiny. That's why it's destiny. And if you try to interfere, the same thing's going to happen anyway. And you'll just suffer. " Tracy Flick (Reese Witherspoon) is running unopposed for student council president of Carver High, and had she not slept with a teacher and summarily ruined his life, there wouldn't have been much of a need for the events that unfurl in Election. Jim McAllister (Matthew Broderick) is a straight arrow government/civics teacher at Carver�and a close friend of the aforementioned teacher. He decides that only way to avoid any sort of unnecessary contact with the potentially steamy loins of Flick is to force another candidate into the mix�in this case dim-witted but sincerely nice jock Paul Metzler (Chris Klein)�with the hopes of crushing the neatly organized dreams of Witherspoon's teenage political powerhouse. But as destiny reminds us, changing the future is not always as easy as it might appear, and a connect-the-dots series of situations become increasingly ugly as election day approaches. Written and directed by Alexander Payne (Sideways, About Schmidt), Election operates with multiple narrators, each of whom overlap and tell their part of the story, eventually revealing how the pieces all connect. Aside from high school politics, adult infidelity and teenage lesbianism are just the tip of the thematic iceberg, and Payne refrains from dumbing down the script into some type of simplistic teen comedy or moronic adult formulaic comedy. Payne's screenplay�adapted from the Tom Perrotta novel�is smartly wicked in its skewering of both high school and adulthood, and while we initially identify with the confused rationale of Broderick's McAllister, the story quickly gets darker and dirtier, until anticipating a clear cut resolution becomes difficult. There's even a couple of red herring moments that a lesser film would have settled for, but Payne steamrolls past those in favor of tormenting his leads just a little bit more. Broderick's McAllister teaches a class about morals and ethics, while Witherspoon's Flick is all about winning, and Election doles out the problems associated with that two-sided coin a number of times as things go south. That's a neat dilemma to watch the leads dance around, but Payne fleshes out the rest of the film with a deceptively solid supporting cast. Klein in particular nails the nice-guy jock role with a truly scary ease, and it only takes watching his period-less campaign speech reading to showcase just how spot-on he nailed the entire ebb and flow of his character. Jessica Campbell, as Klein's sexually confused sophomore sister Tammy, manages to usurp the likes of more seasoned actors like Witherspoon and Broderick, and her onscreen moments are beautifully comic and sweet. As with Klein, Campbell's Tammy launches into an anarchist's dream of a campaign speech, fueled by loner anger and a wise-beyond-her-years foresight that makes the futility of high school seem painfully obvious. Often times comedies cam lose their relevant luster over time, sometimes burdened by an abundance of topical references or out-of-date concepts. Not so with Election, a film that dances around the uncomfortable ripped-from-the-headlines familiarity of student/teacher sexual liaisons as just a small part of the main story. Payne pokes and prods deeper than most one-note comedies would care to go, and the storyline kicks its lead characters hard just when we least expect it. But as Tracy reminds us early on: "That's why it's destiny. And if you try to interfere, the same thing's going to happen anyway. And you'll just suffer." Image Transfer Review: The AVC-encoded 2.35:1 anamorphic widescreen transfer comes almost ten years after the original SD release, and if you was expecting a dramatically grand improvement on BD, then prepare to be underwhelmed. Not that there are any sweeping flaws�unless you count frequent specking and debris issues that really should have been take care of. The transfer has moments of niceness. Fleshtones and colors look pleasant and bright, sometimes brighter than others, though black levels show a marked upswing over the original SD release. Nice, just not jaw dropping. Audio Transfer Review: Audio comes in a 5.0 mix, and I would be hard pressed to identify any specific moments when the rear channels do anything at all. Content is split largely across the fronts, and there are never any issues in understanding dialogue. The few soundtrack tunes peppered throughout sound nice, but don't expect anything too fancy. br>French and Spanish 5.0 dubs are also included. Extras Review: Only only extra, and it's the same Alexander Payne commentary found on the original SD release from 1999. That's a marginal disappointment�not that it's a bad track. It's just that it would have been nice to see something additional or new. Payne's comments are all well and good, especially in regard to fighting the fight to tell the story how he wanted to tell it, but would a fresh perspective have been completely out of the question? 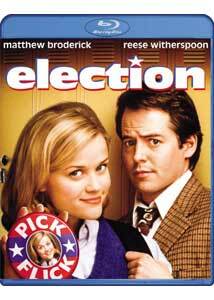 Election pushes some awkward moral hot buttons, yet remains a smart adult comedy that draws high school the way I remember it. Reese Witherspoon shows herself the master of the angry, squinty expression, and her Tracy Flick character is one tightly wound fireball whose entire existence seems built around becoming student council president. The unraveling of poor Matthew Broderick is the fulcrum of the narrative, and his downward spiral is like waiting for a train wreck that we all know is coming. The years have done nothing to diminish the humor, and Election remains a vastly underrated comedy, even if this BD release has nothing new to offer in terms of extras.